Having seen a poor production of one of the Gilbert & Sullivan operas by an un-named group in the area, local girl Margaret Bannon (nee Whiteaker) – fresh from RADA – decided the local community deserved better. So she decided to take matters in hand and do something about it. The Julian was the result. In the autumn of 1948, an advertisement was placed in the local paper for like-minded enthusiasts to join a new company to stage Gilbert & Sullivan in as professional a way as could be achieved by amateurs. 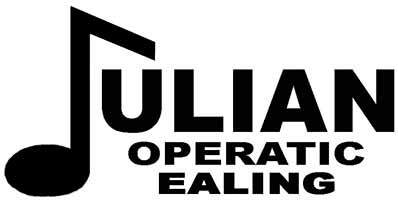 On 21st April 1949, the Julian Light Operatic Society opened in the YMCA hall in Ealing with their first production – Iolanthe. The Julian takes its name from Julian Avenue in Acton where Margaret Bannon lived with her father Dave Whiteaker, the founding chairman, and mother Mary, the founding secretary. It was very much a family affair for the first 25 years when two shows were performed annually, mainly at the Acton Town Hall. The Society departed from G & S in 1966 with Strauss’ The Gypsy Baron and since then the repertoire has varied to encompass other popular light operas such as Strauss’ Die Fledermaus and Lehar’s The Merry Widow. Various shows from Offenbach, such as La Belle Helene and Orpheus in the Underworld, were also included. The Society continued to perform at the Acton Town Hall until 1973 but transferred to the newly built Greenford Hall in 1974. With rising costs and reducing audiences due to demographic changes, the number of full productions was reduced from two a year to three every two years. Then, from 1998, only one major show has been staged each year – in the autumn – with an intermediate concert in the spring. A further significant change took place in the Society's history in 2002 when they performed for the first time at Questors Theatre in Ealing. A "Thrust" stage is popular at this theatre which has become the new home for major productions. Committee members: Alvina Doughty (Patron’s Secretary), Cathy Hickling (Membership Secretary), Helen Gargan, Graham Ceadel. Click here to download the company's current constitution.